This fall, the ground-breaking fifth science run of the LIGO interferometers came to a successful conclusion as an integrated full year's worth of science data was accumulated with all three LIGO interferometers in coincidence. The interferometers--antennae tuned to detect the delicate ripples of gravitational-waves coursing through the fabric of space-time--have achieved unprecedented sensitivity and astrophysical reach, as well as excellent duty cycle. The fifth science run (S5) began in November 2005 with the goal of gathering one year’s worth of three-interferometer coincident data with an effective range of ten megaparsecs (1 Mpc equals 3.26 million light years) or better for the four-kilometer interferometers, and five Mpc or better for the two-kilometer interferometer. The effective range measures the sensitivity of the interferometers to signals arising from binary systems composed of 1.4 solar mass neutron star pairs having a signal-to-noise ratio of 8:1 or better, and is computed by averaging over both the antenna sensitivity pattern and over all possible orientations of the binary systems. At its conclusion, S5 had achieved an effective range of more than 15 Mpc for the four-kilometer interferometers, and seven Mpc for the two-kilometer interferometer. Because of the approximately cubic dependence on range of the population of extragalactic sources, the volume of the cosmos probed increased by a factor greater than three above our original goal for the run. Sensitivity and high duty factor combined to make the S5 run a great success. Considered over the entire run, the average single interferometer duty factor was 73.6 percent, the average two-site coincident duty factor was 59.4 percent, and the average triple-interferometer duty factor was 52.5 percent. Performance gains mounted over the course of the run. S5 began with an average triple interferometer duty cycle of just under 50 percent but in its final months was topping 67 percent, an increase that demonstrates our ability to push the interferometers to ever better performance. For those periods when the instruments did suffer an unexpected loss of lock, environmental disturbances such as large storms, major earthquakes, and cultural activities like trucking, logging, and public utility maintenance, were the main sources of interruption. Figure 1. 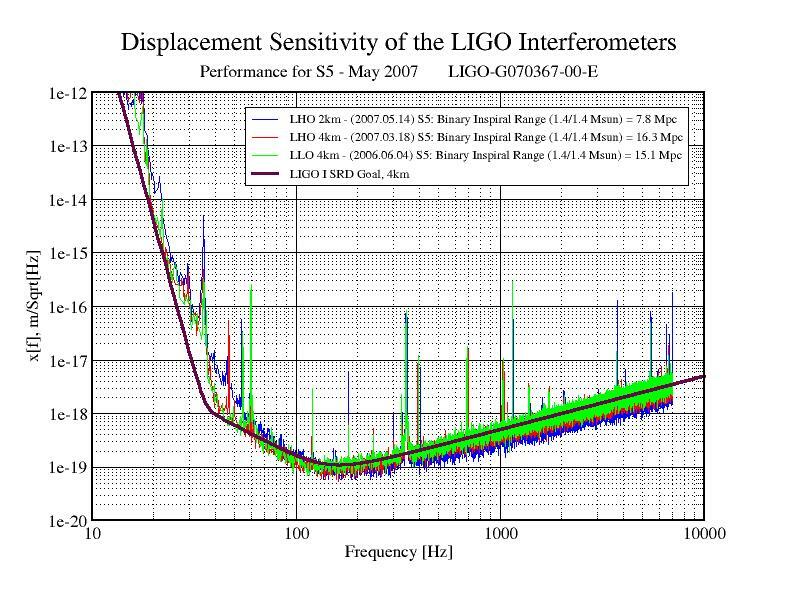 Displacement Sensitivity of the LIGO Interferometers. 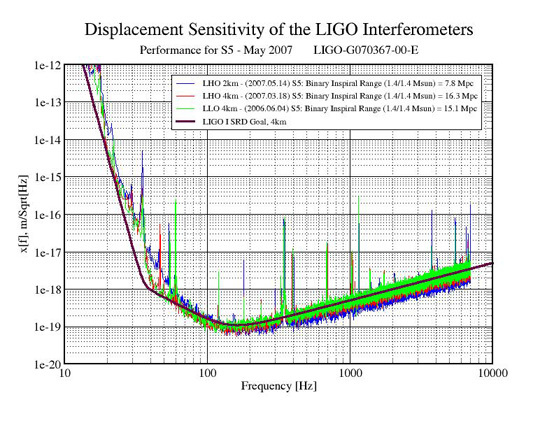 Figure 1 above shows the displacement sensitivity of the three LIGO interferometers across the gravitational-wave frequency band of interest to LIGO. The solid curve is the optimum sensitivity predicted in the 1995 Science Requirements Document. Preliminary results from a few high-profile searches using a fraction of the data, and a number of upper limits of astrophysical significance have been presented at recent conferences. Analysis of the full data is underway, some segments in partnership with our Virgo colleagues, and papers will be prepared for release and publication in the coming months. We anticipate search results from a number of gravitational-wave sources--inspiraling pairs of neutron stars and/or black holes, burst sources such as supernovae, periodic sources such as pulsars, and possible stochastic backgrounds due to multiple diffuse sources or relic gravitational waves from the big bang. S5 demonstrated not only that the instruments can perform as required, but that the LIGO Scientific Collaboration has honed its ability to analyze the data in an effective and timely manner, and to publish results of astrophysical significance. LIGO now moves into its next phase of progress, Enhanced LIGO. This consists of a set of upgrades and hardware improvements designed to extend the interferometers’ astrophysical reach. 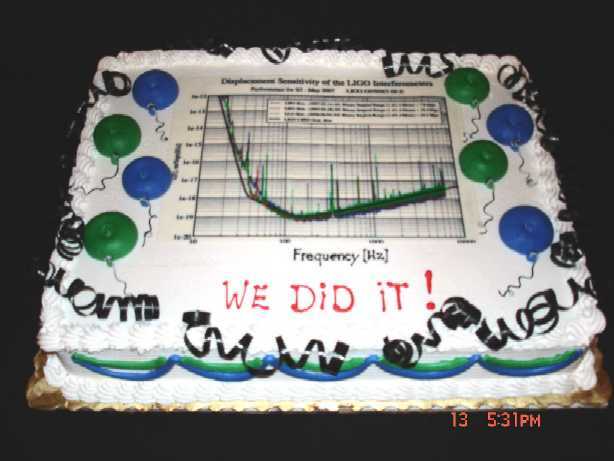 By increasing the power of the input laser to about 35 watts, modifying the dark-port readout to use DC readout in vacuum with an output mode cleaner to reduce unwanted light, and other minor modifications, the range of the interferometers will be increased by a factor of two and the extragalactic volume to be probed will increase by eight-fold. The LIGO Hanford Observatory in Washington State (left); and the LIGO Livingston Observatory (right) in Louisiana. 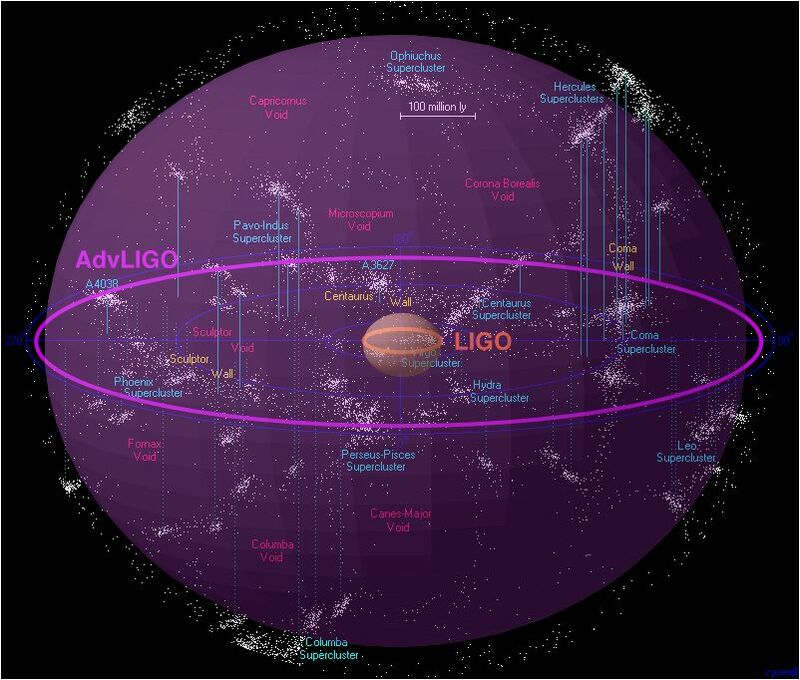 As depicted in the illustration below, Advanced LIGO is an ambitious project to improve LIGO’s sensitivity by a factor of 10 and increase its source reach (the number of extragalactic sources within its range) by a factor of 1000. As a result, Advanced LIGO is expected to observe gravitational-wave signals from such cosmic sources as merging pairs of black holes and neutron stars at the rate of several each month. 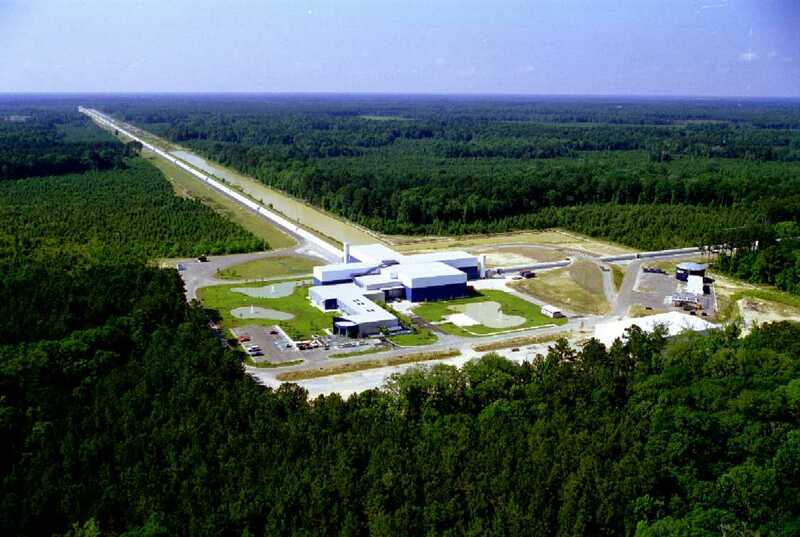 Because the characteristics of the source of the gravitational waves is encoded in the waves themselves, Advanced LIGO will pioneer a new form of astronomy utilizing gravitational waves to observe and interpret some of the most violent events happening in the universe. 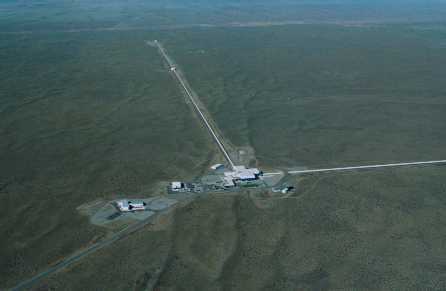 Construction on this stage will begin early in 2008, with first observations using the Advanced LIGO configuration scheduled to commence in 2014.